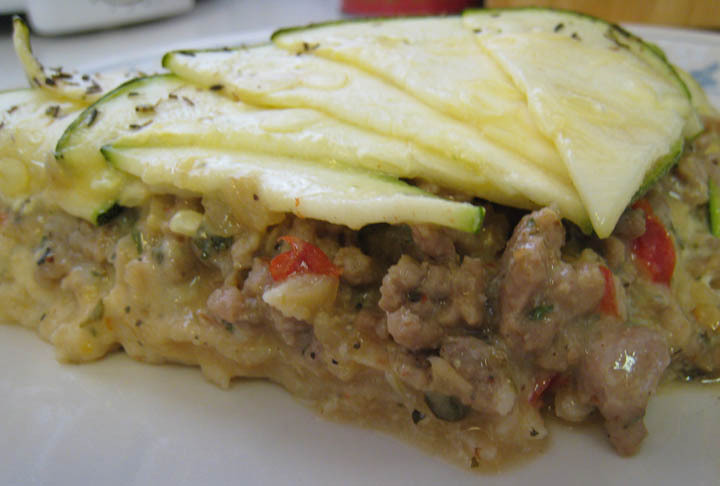 Pork & Zucchini Pie has always been one of my favorites. Moist pork and juicy zucchini mixed with egg and cheese gives you a dish that is inviting. 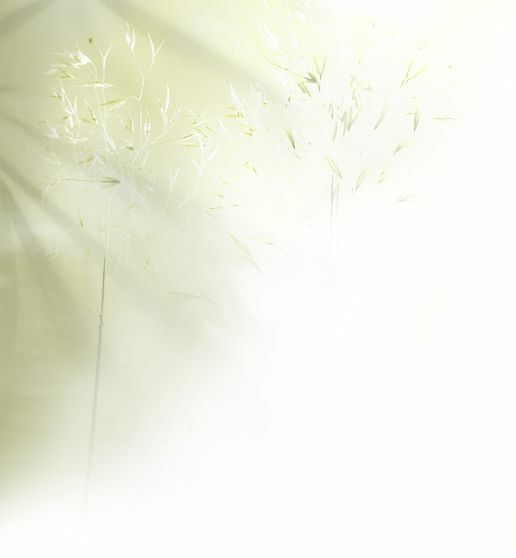 It is home and comfort at any time of the year. A dish like this would start out at about 680 mg of sodium and can climb well over 1800 mg's. The salt in this recipe is natural salt with just a little dash of sea salt to bring out the flavor of the zucchini. You can also cut a little more of the salt if you make your own Italian Mozzarella cheese. Per Serving: - Calories 424; Sodium 546mg; Fat 25g; Protein 26g; Carbohydrate 25g; Cholesterol 77mg; Dietary fiber 4mg. In a skillet, spray olive oil bring to a medium heat and saute 1/2 onions & bell pepper. Cook until tender, about 6 minutes. Add ground pork, parsley, basil & 1/4 tsp red pepper flakes and cook till done, about 8 minutes. Add 2 cups of sliced zucchini to mix and the balance of spices. Cook for 2 minutes more, set aside. In a separate bowl mix together the egg, cheese, 1/4 tsp red pepper flakes & minced onion and set aside. In a 10" glass pie pan, spray with olive oil and place tortillas on the bottom of pan overlapping to cover complete bottom of pan. Spread mustard over the tortillas then add egg & cheese mixture. Place in oven and bake for 10 minutes. Remove from oven and add the cooked pork mixture evenly over the baked egg mixture. 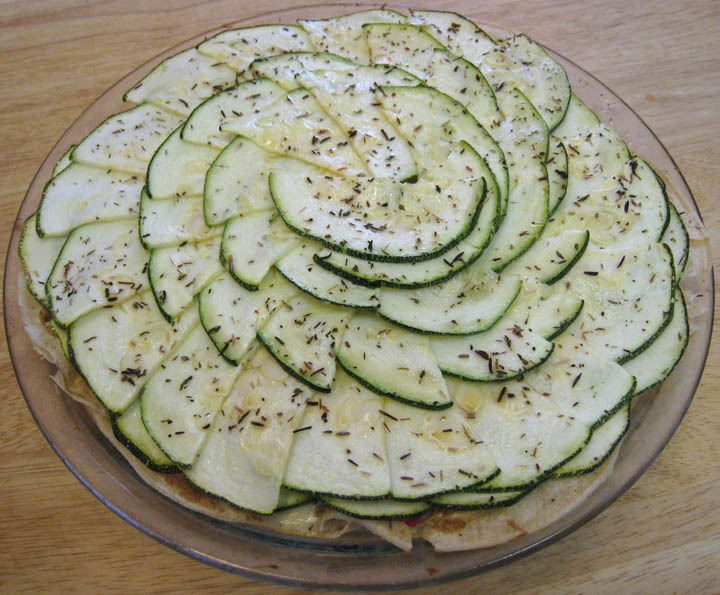 Add 1 cup of zucchini slices to cover the top of pie, sprinkle salt, 1/8 tsp of black pepper and no salt seasoning over zucchini and spray with olive oil . Cover the pie with foil and cook for 15 minutes in oven. Remove foil and cook for 5 minutes more.